Handcrafted Sterling Silver Pendant Necklace, "Laughing Elephant"
A symbol of luck, this laughing elephant comes to life in sterling silver. Aoy presents the delightful pendant on a cable chain necklace. 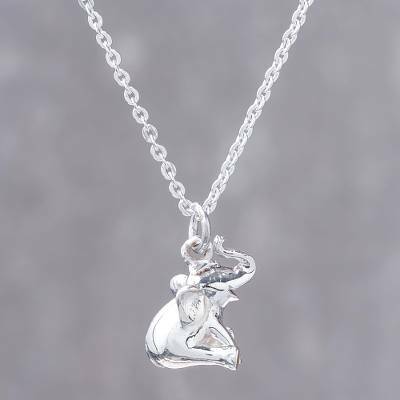 You can find sterling silver pendant necklace 'Laughing Elephant' by Aoy in jewelry categories such as Animal Themed Necklaces, No Stone Necklaces, Sterling Silver Necklaces and Pendant Necklaces. Enjoy exploring these sections for other Novica treasures. It is so nicely made. It is heavy in the metal and so real looking. I can't help but smile every time I see him. Very cute and lovely pendant. Makes me smile whenever I look at it. Great work! Very cute little pendant, and solid. It was a bit smaller than I expected, more the size of avlarge charm. Very detailed. Gorgeous laughing elephant pendant. Exquisite workmanship. Thank you. Highly recommend. small elephant charm, hangs sideways, wish the chain were longer!! This is darling and the only one of its kind I have seen. I love the symbolism of the laughing elephant. This little elephant is a real charmer. He is smaller than I expected, but he is weighty and adorable. Love him! I bought this laughing elephant necklace for my daughter in law who loves elephants. Oh my it exceeded my expectations . Beautifully crafted and straight up adorable . People always comment on it when she wears it . I am very very pleased. This elephant pendant is beautifully made, a nice weight so it hangs perfectly on my chest. It can be switched out and put on another necklace; I will occasionally pair it w/a 20 inch silver chain. The workmanship is exceptional and I am thrilled with my purchase. "Cute small charm size elephant." I love elephants and he is really cute little guy. Very well made-just what I was looking for.